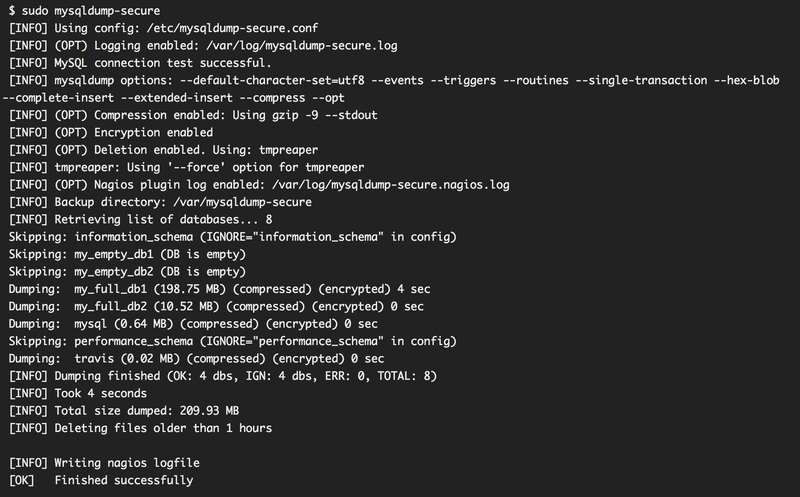 Mysqldump-secure is a POSIX compliant wrapper script for mysqldump with encryption capabilities and strong security in mind. It will backup every available database (transaction-safe across tables) as a separate file with the possibility to opt out via blacklisting. Dumped databases can optionally be on-the-fly compressed (gzip, bzip2, xz, lzma, pigz, pbzip2, etc) as well as encrypted with openssl assymetric encryption (no password needed). Compression and encryption is done before the file is written to disk to avoid possible race conditions. Apart from that mysqldump-secure is able to apply conditional dump options to each database separately by inspecting certain metrics such as size and table engines prior dumping. Other features include: log4j based log levels, nagios integration, tmpwatch/tmpreaper integration, master/slave recognition and completely self-validating, meaning if anything goes wrong, it will tell you what went wrong and how to fix it. mysqldump-secure is like mysqldump on steroids. See travis-ci for builds and live usage. Just click on the image below to see the travis-ci builds. Easy integration into Nagios or Icinga. Get running within 30 seconds.